If you’re sitting right now, stand up. Walk a few steps or wave your arms in the air. Maybe do a quick dance move. OK, finished? You just did something really good for your health and well-being. That’s according to the latest Physical Activity Guidelines for Americans, released this week by the U.S. Department of Health and Human Services. The new guidelines update ones published in 2008, and although the amount of exercise recommended isn’t different, the new guidelines incorporate some recent, tantalizing findings about the ways people can get in their exercise, promising to make the standards easier to meet. Whether these changes can overcome the human inclination to lie on the couch remains to be seen. The new advice in a nutshell: Sit less and move more. What matters most is your total activity — whether it’s continuous or not — and every step counts. As before, the guidelines call for 150 to 300 minutes of moderate-intensity activity per week, unless the exercise is vigorous, in which case you only need 75 to 150 minutes per week. The guidelines also call for some kind of strength exercises twice per week. The new guidelines make it much easier to notch those 22 minutes per day, at least in theory. Previous guidelines said that activity needed to last at least 10 minutes before benefits started accruing, but based on the latest evidence, the new guidelines say that activity is cumulative, and even minute-long spurts can make you healthier. “That’s a sea change. Everything counts,” said Abby King, a professor of medicine at Stanford who co-chaired the guidelines committee. If you’re worried about hitting 22 minutes, know that there’s nothing magical about that amount. That was just the amount the committee settled on, because it strikes a good balance between achievability and benefits. “People like to have something to shoot for,” King said, but the benefits of exercise exist on a continuum. “The message is that it’s a continuous relationship — the more you do, the more benefits you get. There’s no threshold you have to meet,” she said. Some of the most significant benefits actually occur at the lowest levels of exercise, and right now, only about 20 percent of Americans meet the minimum guidelines. 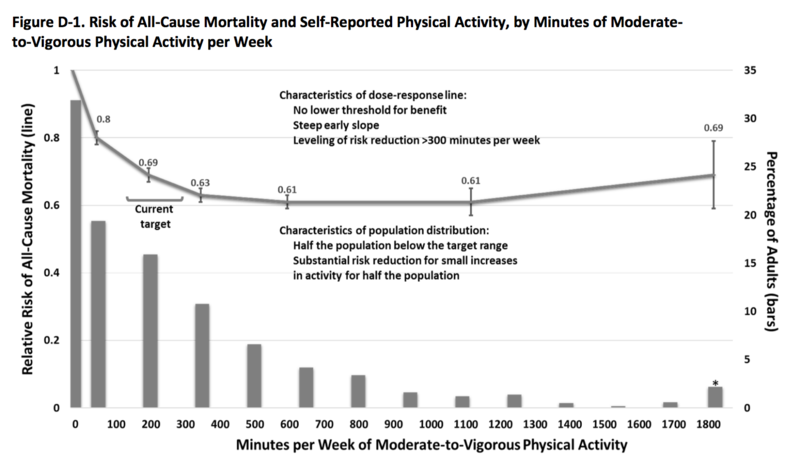 The chart below, taken from the advisory committee’s report, shows that doing even a little bit of exercise lowers mortality risk. The bars illustrate the percentage of people reporting different levels of exercise, while the line shows the mortality risk at each amount of exercise. With those stats in mind, “The emphasis is on, ‘let’s get most people doing something rather than trying to get fewer people doing a lot’,” said John Jakicic, director of the Healthy Lifestyle Institute at the University of Pittsburgh, and a member of the guideline committee. The greatest benefits actually happen when people go from doing nothing to doing even small bits of exercise, which means that a lot of Americans have something to gain from a few baby steps. Lessons like these have come in part from new technologies that scientists are using to study the effects of both exercise and sedentary behavior. Until recently, researchers mostly collected numbers on exercise using self-reported data, which was subject to recall bias and other problems. But with the advent of wearable measuring devices and the explosion of smartphones and fitness trackers that count every step and acceleration, researchers can now capture every bout of movement, not just the ones people recall, Jakicic said. That’s allowed the studies to look at small exercise bouts more precisely. Which is great — but are these guidelines likely to change anything? By now, one has to imagine that everyone in the country knows exercise is good for us. Charles Hillman, a psychologist at Northeastern University who served on the committee, noted that research shows a bout of exercise can help people process information more quickly, allocate attentional resources better, and have better working memory immediately following the activity. But as you see in the chart above, plenty of people are struggling to do the exercise. That, perhaps, is why the overarching message of these new guidelines is that you can do this! 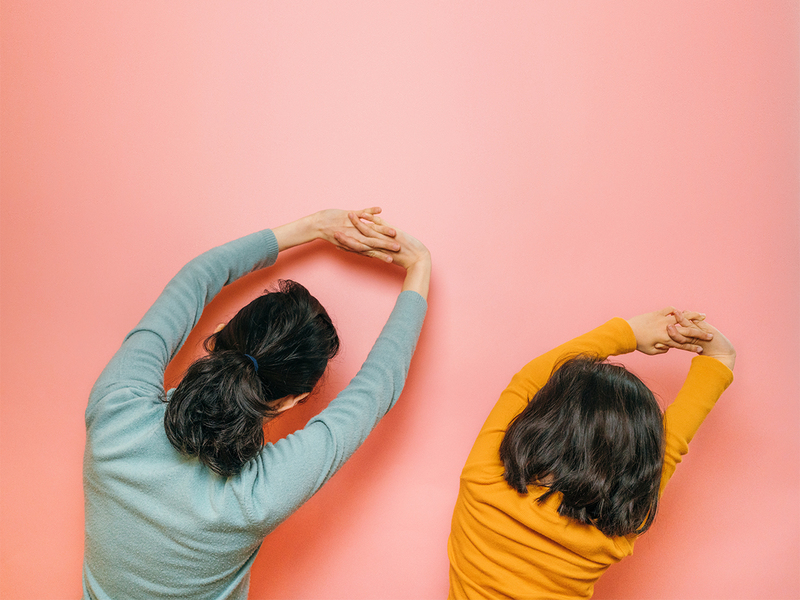 As part of the guidelines rollout, HHS unveiled a “Move Your Way” campaign to help people find ways to incorporate movement into their lives, and the guidelines include some evidence-based advice for taking up exercise, like get support from peers and use technologies like step counters and text reminders to nudge you along. “If we had a drug that did all this, everyone would be taking it,” said Katrina Piercy, a physical activity and nutrition advisor at HHS who was the lead writer on the guidelines. This is something I’ve heard from almost every researcher I’ve ever interviewed about the health benefits of exercise. Perhaps this time people will listen.